Heavy-Duty Cable Layer by EZ Trench. Digs the trench, lays the wire, backfills the trench all in one opeation. Used to install hidden pet fence, low voltage landscape wiring, control cables. 6.5 h.p Honda engine. Weighs 150 lbs. Makes a trench 1 1/2" wide by either 2" or 4" deep. This unit is not self-propelled, but moves easily. Depending on soil conditions, cable layer can install 15' to 20' per minute. Click here for an important operational video for this cable laying machine. 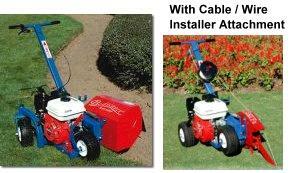 The Bed-Scaper attachment is for creating a clean, sharp mulch line for flower beds and around trees, etc. The Bed-Scaper will dig either a 2" or 4" deep trench at a 45 degree angle. Click here for an important operational video. * Please call us with any questions about our cable installer/bedscaper rentals in Oak Grove MO, Blue Springs MO, Independence MO, Lexington MO, Odessa MO, Independence MO and Western Missouri.